I don’t know about you, but I am a huge fan of children’s books. Maybe it’s because I’m primarily at an elementary school setting now, but I feel like I love them more as an adult then I ever did as a kid. So, one of my favorite things to do with the kids at my school is to incorporate different books in to the classroom activities we do. This month marks the start of spring, and so I thought I’d start off with one that my school kids loved! Corduroy’s Easter Partyis a quick and fun read about Corduroy and his friends getting ready for Easter. Corduroy’s friends are excited for the Easter Bunny to visit, but Corduroy isn’t so sure if he believes in the Easter Bunny. It’s a really cute story involving childhood belief, and how to support your friends even if you don’t always agree with how they think. And in the end, Corduroy is pleasantly surprised by a new, furry friend! If you’re looking for fun crafts to go along with this book, then I definitely recommend these three below! This craft was originally posted on Sunny Day Family. This is a fun and simple craft, and what’s more fun then having your kids make their very own Easter baskets? 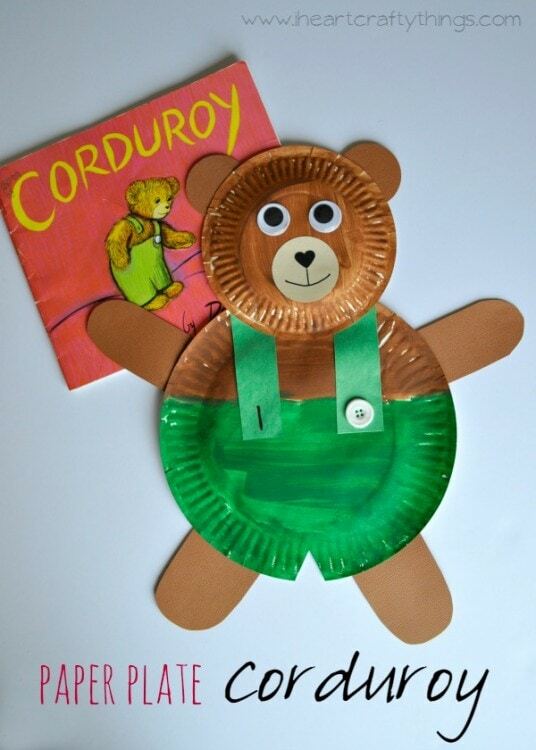 While it may not be as fuzzy, these paper plate Corduroy craft is one that is simple and easy to make, and super fun to hold on to if you plan on reading any more of the Corduroy books! This paper plate Corduroy from iheartcraftythings is a personal favorite of mine! What could be more fun(and in season) then decorating your own Easter eggs? This craft is one you could bring out every year around the season, either for decoration or simple to make more! This craft is originally created by Hello, Wonderful. I hope that you enjoy the crafts here as much as my kids have, and if you decide to do any of them then show them off in the comments down below! And, of course, be sure to support the awesome websites that originated these crafts by clicking the links provided! If you appreciated this post and feel like supporting an independent creator, feel free to buy me a coffee!